I am a frugal person, some might say cheap, but I don’t take offense at that. I drive a ten-year-old vehicle with 200,000+ miles on the odometer and am hoping for 200,000 more, no doubt a result of a childhood sharing a two bedroom, one bath post WW2 bungalow with my parents and brother and sister, traumatized by enduring countless stories of the Great Depression from my parents: “Eat your bean soup; we’d have been happy to have that during the Depression!” Mom had to quit school after eight grade, Dad after tenth, to work and help their families survive those very difficult years. 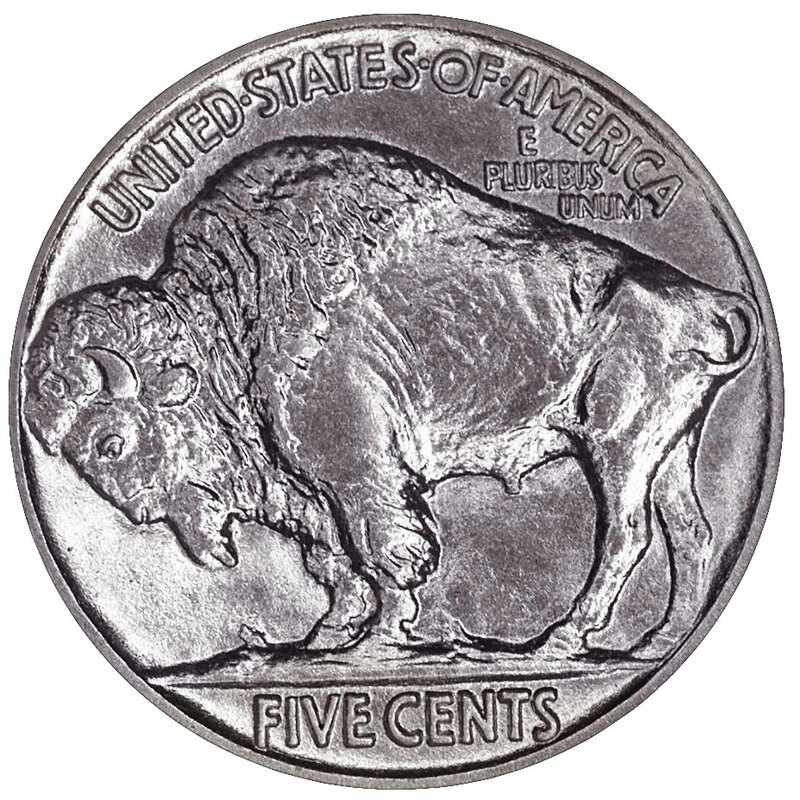 According to Dad, Mom could sqeeze a nickel until the buffalo shat (younger readers may not understand this cultural reference). What I’m getting to in a roundabout way is that I don’t spend a lot on gear. In my prior incarnation as a western flyfisher, I had exactly two flyrods and reels, both entry-level but serviceable outfits. I tied (and still do) my own flies and crafted my own leaders. My eight-and-a-half -foot six-weight is an inexpensive LL Bean. I fished this rod and reel exclusively for many years, then became convinced I needed a “small-stream” rod and purchased on sale a seven-foot Redington rod, which I paired with the least expensive Orvis large arbor reel. For reasons not well understood, I found myself rarely fishing the shorter rod, even on smallish streams with a lot of bankside vegetation. Perhaps it was the lack of “reach” with that rod. A week ago I was visiting my son and his family in Colorado. 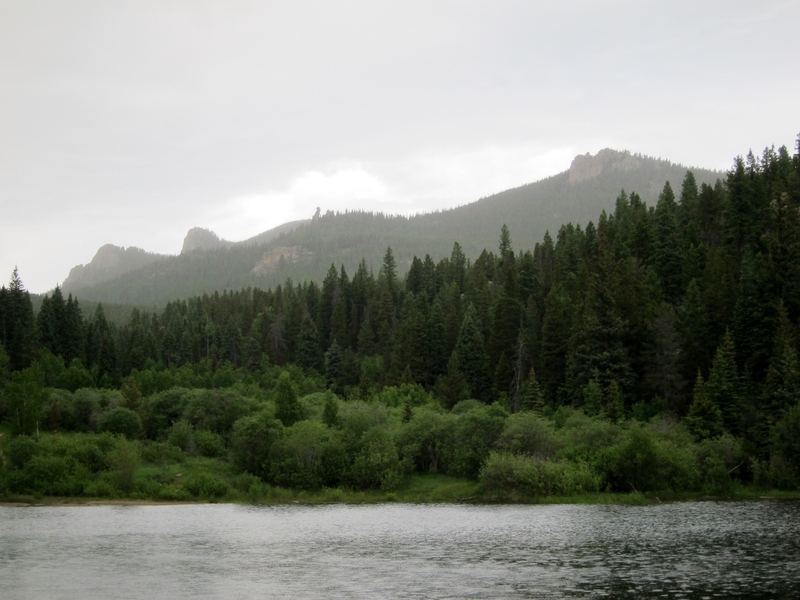 My wife and I, along with my son, his wife, and two children, went camping in the mountains at Golden Gate Canyon state park, a very scenic park with great facilities near Denver. Four or five ponds in the park are stocked with trout, and I recognized an opportunity to introduce fishing to my six-year-old grandson and three-year-old granddaughter, casting nightcrawler bits suspended under bobbers from their Snoopy rods to uneducated stockers. The week prior to traveling to Colorado, I had broken the tip of my Iwana while kayak fishing a local lake, not taking the appropriate care clearing a snagged fly. A new tip ordered, I arranged for it to be shipped to my son’s address, and it was waiting for me when I arrived. After a half-mile hike to one of the park’s stocked lake, we hurriedly rigged up, a steadily freshening wind foretelling a storm brewing in the west. An attractive little lake, evergreens hugging the shore, the mountains visible in the distance. I tied on a new length of level line and a short tippet onto the new Iwana tip. With the first cast, I realized I had cut only about nine feet of level line and about 2 1/2 feet of 5x tippet; in other words, a total of approximately 5-6 feet less line/tippet that I usually use. Needless to say, this setup was really inadequate for lake angling, but with a strong wind building and rain beginning to fall, I could not take the time to re-rig. I did manage to catch one small cutthroat on a #14 black deer hair beetle. More importantly, my six-year-old grandson caught one (his first fish) on a nightcrawler morsel. Soon we found ourselves sprinting back to the car. From there we drove to Idaho Springs, a gritty but picturesque mining town to enjoy some Colorado-style pizza at Beau Jo’s. I really can’t say enough about the pizza served here, certainly among the best I have tasted. If you find yourself in the vicinity, try it. 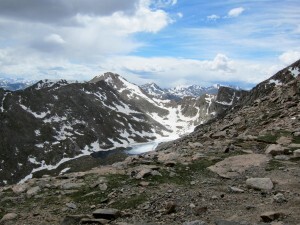 After lunch we split up, my son and his family driving back to Denver, and my wife and I making a long-awaited drive up the Mount Evans highway, taking highway 103 from Interstate 70. What a great drive up the highest paved road in America to the 14,130′ summit of Mount Evans. Spectacular views. (More on that drive in a future post). One thing that really intrigued me about this drive was the small creek I noticed running parallel to the highway with a number of pullouts to park the car. After completing the drive to Mt Evans we reversed course, and I parked at one of the pullouts I had spied on the drive up. My wife, recovering from foot infection, chose to stay in the car while I fished. The creek is called Chicago creek, one of those smallish, high-gradient, freestone streams so common to the mountain west. I would estimate the creek’s width as generally twelve to fifteen feet, the water coursing clear and fast, perhaps a bit high still from snowmelt. 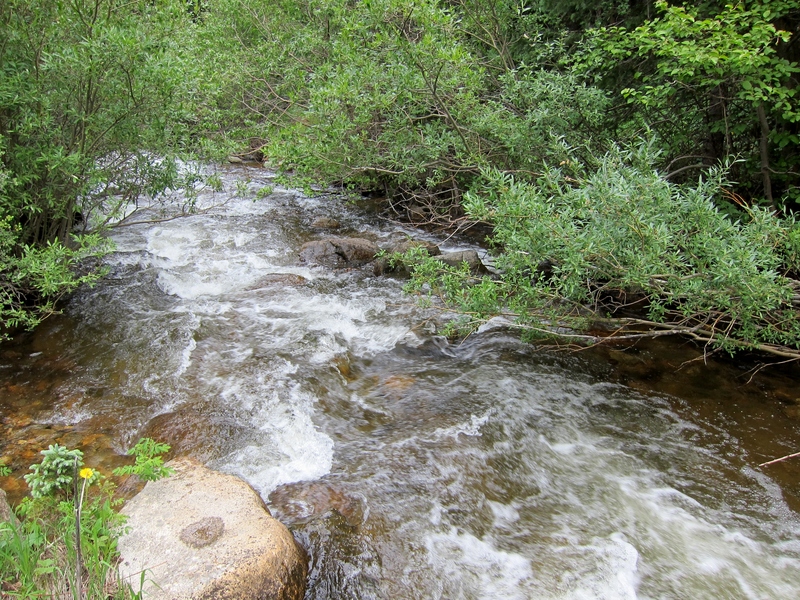 At the edges and around the boulders were arrayed all those small pockets of still water that offer so much promise. I was still rigged up from the lake fishing earlier in the day, and I quickly uncoiled my line from the EZ Keepers, the deer hair beetle still attached to the tippet. The canopy along the bank is dense, but I quickly discovered that the shorter line and tippet, a detriment earlier in the day at the lake, was in fact an advantage on this small stream. Casting to the opposite bank was still very easy with the 12′ rod, and line control was much better than it would have been with my customary longer setup. Second cast I was attached to a eight-inch brown. 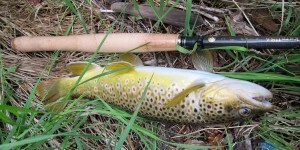 Thereafter followed a number of browns and brookies in the 6-8″ range. Having lost the beetle to a snag, I tied on a #16 Deer Hair Caddis, cast it to a promising seam and was rewarded with a take by a 12″ brown, a great fish for a stream this size. Hooked, thrashing, washed by the swift current over a little waterfall, I had little hope that I would be able to land it. But the hookset held, and soon the brown was at hand. 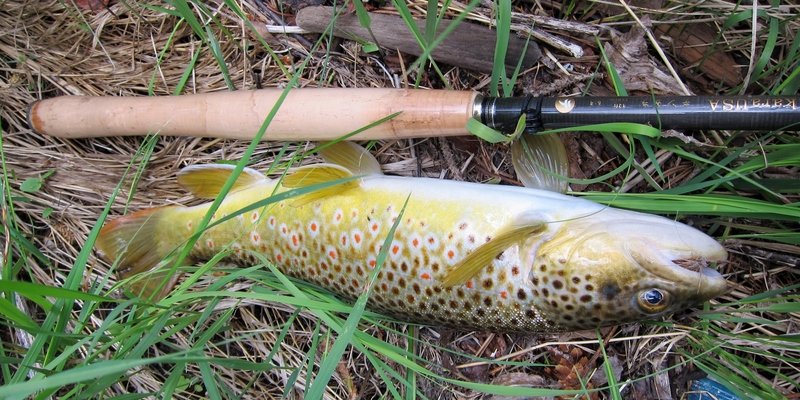 In summary, then, my epiphany that day is as follows: When fishing tight streams, casting is going to be more difficult regardless of the type of rod used, spinning, western flyrod, or tenkara. Rather than purchasing that shorter rod and sacrificing reach, try a shorter line/tippet. I believe the longer rod/shorter line combo allows one to keep the flyline off the water more easily than with a shorter rod. Just think of the money you’ll save.